I’ve been away from blogging for about 6 weeks which is very unusual for me but it’s been a busy time! I recently left my job to work for myself making cakes and then I went on a trip of a lifetime in America so I was away from work for a while. We started our trip in Michigan visiting my aunt who lives there now and then we flew to San Francisco. 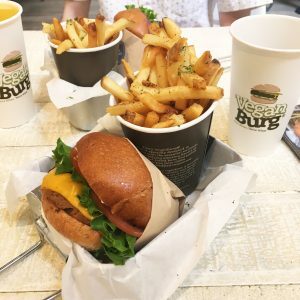 I had done a lot of research into vegan food there (because I am known to get hangry) so I needed some places up my sleeve where I could grab some food. 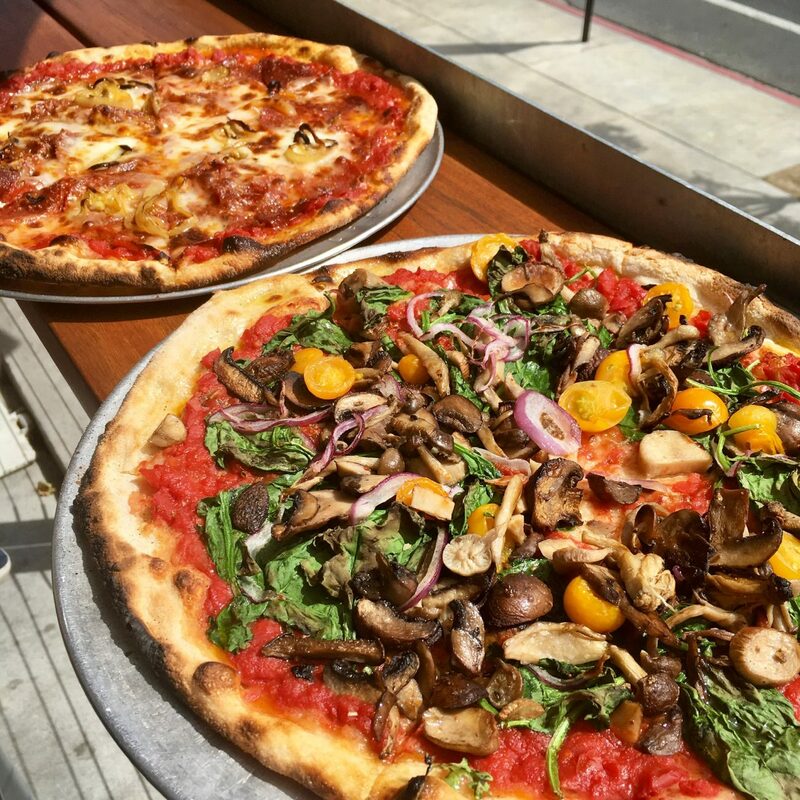 Here’s my vegan San Francisco guide with all the places I went to all in one place. First of all we went to Target to stock up on supplies. We stayed in an Airbnb with a small kitchen so we knew if we couldn’t find vegan food there would always be something in the fridge. I’ve never been to Target before so we were in there for about an hour. At one point I thought we’d never make it out. 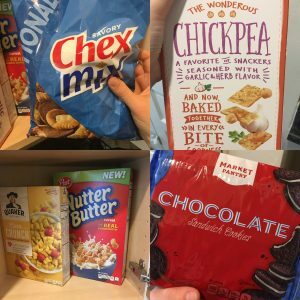 We bought hummus, carrot sticks and crackers which worked well as a light meal after all the massive portions when we ate out, some Oreos, cereal and Chex/trail mix. I was pleased to see savoury Chex mix is vegan as I tried the cheese flavour in New York and loved it. 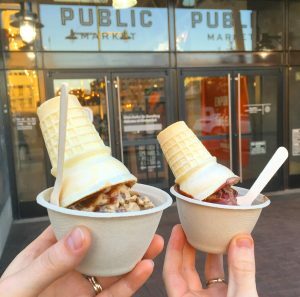 Public markets became our friend as there was always something for everyone. I first came across them in New York when we went to Dough in City Kitchen. They’re great because there’s a mix of businesses and food so whatever you fancy or whatever requirements you have, there is most likely something for you. 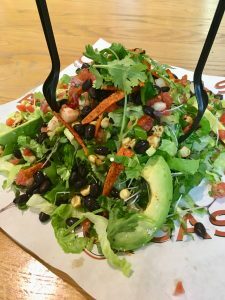 We went to Emeryville public market and I had a massive taco salad from C Casa and Billy had waffle fries but I don’t remember the name of the place. We finished off our meal with ice cream from Mr Dewie’s Cashew Creamery which was all vegan including the hot fudge sauce! Another one we went to was the Oxbow public market in Napa. We both had pizza from Live Fire Pizza. 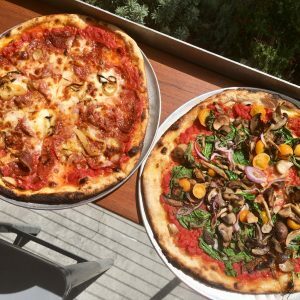 Mine is the one with all the mushrooms on and was a tasty vegan option. I could have also had a vegan milkshake but after devouring the whole pizza I was far too full. I knew I wanted to go to VeganBurg in Haight Ashbury so we went there after walking the golden gate park. There were eight burgers to chose from which seemed like a lot when you’re used to not having choice. They all looked great but I went for the smoky BBQ and Billy had the cracked mayo. We also had fries and a drink and I can recommend the homemade iced tea. We both loved our meals, in fact I think Billy liked it most and he’s not even vegan! 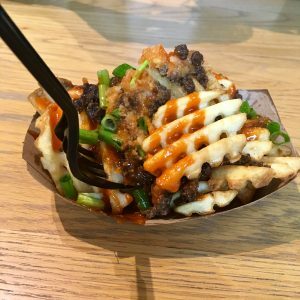 The seaweed salt on the fries was a particular favourite. 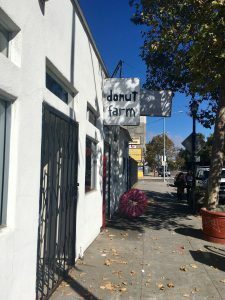 Another place on my ‘to eat’ list was Donut Farm and I’m not going to lie, I almost cried when we went to the Ferry Building and it was closed. However the main bakery and cafe is in Oakland and not too far from our Airbnb so on our last day we walked there. 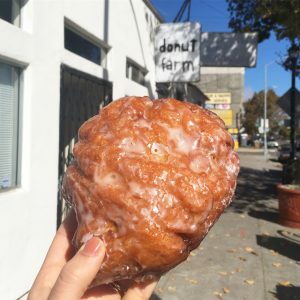 There was so much choice and to be honest I eventually chose the apple fritter because it was the biggest. I wish there was one near where I live! Our last meal in San Francisco was actually across the bay in Emeryville. Rudy’s Can’t Fail Cafe was just across the road from our Airbnb so it was perfect for our last day because after stuffing ourselves we could cross the road and collapse on the sofa before starting our packing (collapsing on the sofa was necessary once you see the portion sizes). I had the veggie club with hash brown and Billy had the veggie sausage scramble. We weren’t initially going to go there to eat but I’m so glad we did because we would have missed out otherwise (and yes I did eat it all). My favourite food in San Francisco was the ice cream or the donut but I would eat everything again. 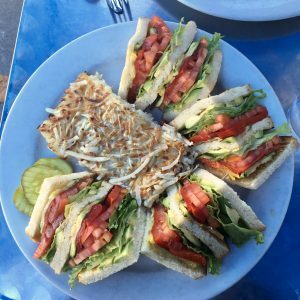 The next place we went to on our trip was Yosemite which had some surprising food options!